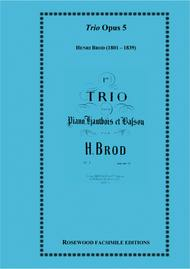 Composed by Henri Brod. This edition: Facsimile Editions. Operatic, with variations. Classical. Score and parts. Published by Rosewood Publications (RW.RFE-71). 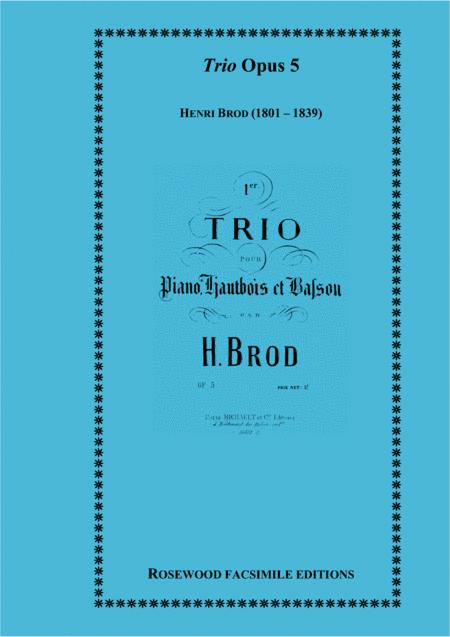 Henri Brod (1799-1838) was a highly distinguished French oboist, teacher, composer and instrument maker. He entered the Paris Conservatoire at the age of 12 and graduated with distinction at 20, with first prize. Brod studied composition with Anton Reicha and oboe with August Gustave Vogt (1781-1870), who was the oboist in the wind quintet for whom Reicha wrote his works. Brod shared the oboe desk with his teacher at the Opera and Conservatoire concerts. (The never-dull music critic Fetis found Brod's tone sweeter than that of his teacher.) From 1932 he was appointed the second in a line of professors of oboe at the Paris Conservatoire and was awarded the Legion d'Honneur in 1838.